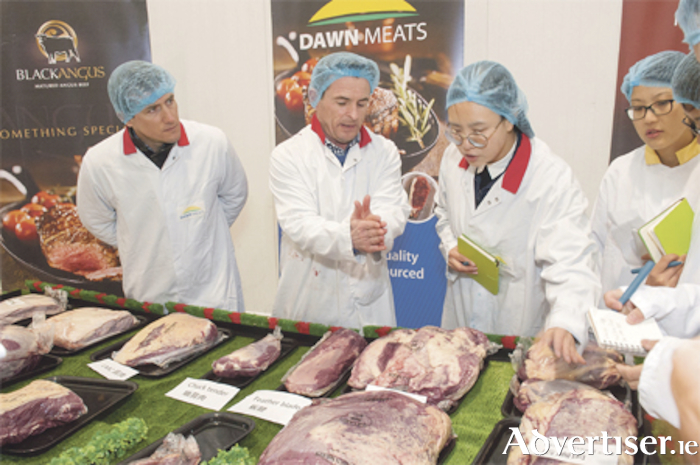 Ireland is the first European beef exporter to secure access to the market in China, where consumers’ appetite for the meat is reportedly growing steadily. According to Bord Bia, China officially imported more than 700,000 tonnes of beef in 2017, a figure expected to double by 2020. In China, annual per capita beef consumption is low at 4kg to 6kg, compared to 19kg in Ireland. However, consumption is on the rise. An average annual increase of just 1kg per capita equates to an additional 1.38 million tonnes of beef per annum, and by 2020 it is estimated Chinese consumers will eat close to nine million tonnes of beef. Bord Bia CEO Tara McCarthy said: “Bord Bia, and in particular our Shanghai office, has been actively planning and preparing for today’s breakthrough, and we are now well-positioned and ready to maximise this significant opportunity for Irish beef exporters. “Today’s timely announcement follows just days after we hosted the China Meat Association and 17 senior representatives from leading Chinese meat importers as part of our Marketplace International event. All of the visiting Chinese delegates had the opportunity to visit Irish beef farms and processers, giving them a first-hand experience and insight into Irish food production. Last year, Bord Bia won a contract to promote EU beef and lamb in China, Japan and Hong Kong in a campaign valued at €3.75 million. The timing of the campaign (2017-2019 ) will be beneficial to Ireland’s beef exporters, as Bord Bia’s management of the initiative has widened the recognition of Ireland as a secure supplier of safe and sustainably produced beef and lamb.